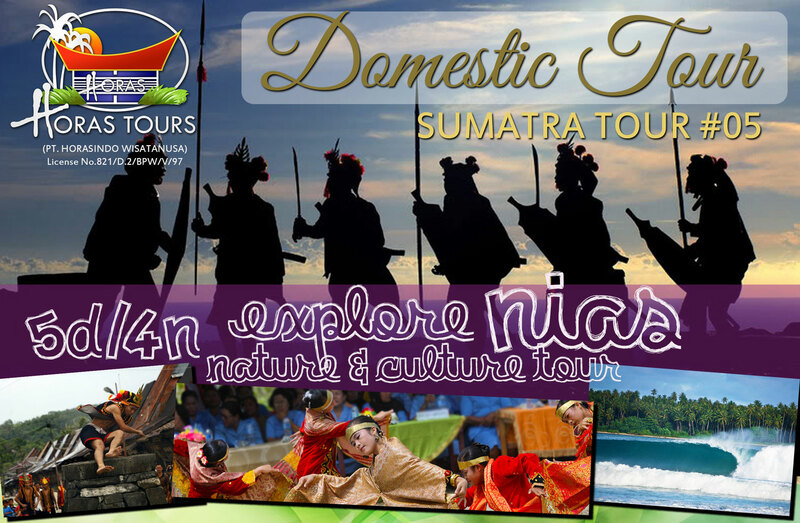 5D/4N Explore Nias Island: Nature & Culture Tour Day 01 : Medan Kuala Namu – Gunung Sitoli – Lagundri Beach Welcome to Nias Island! You are in for a fun and insightful adventure to one of Indonesia’s hidden gems. Upon arrival at Binaka airport at Gunung Sitoli, you will be greeted and catered by our English-speaking guide. We will depart at once to the spectacular Lagundri Beach on Southern Nias, known for its world-class waves. This horseshoe-shaped beach is a beautiful sanctuary for travelers and the perfect haven for surfers. Proceed to Teluk Dalam area for hotel check in. Day 02 : Bawomataluo Tour Embark on a fascinating discovery to the unique Nias culture today. Depart from hotel after breakfast to explore the traditional houses of Bawomataluo Village (Sun Hill Village). Take a look around their megalithic culture and the mesmerizing array of the King’s houses. Don’t miss out the famous ‘War Dance’ and ‘Stone Jumping’ performance, where the jumper has to leap over 1.8 meter stone (available upon request). Following a local lunch, we will visit Hilisimaetano and Hiliamaetaniha traditional villages to see the Nias life in action. Back to the hotel and have the rest of the evening for free activities. Day 03 : Soft Tracking Ono Hondro – Sifalawa – Hilinawalo Gear up for a morning soft tracking where you will get a glimpse of the conventional day-to-day village life of Nias tribe. We’ll start the path from Ono Hondro all the way to Sifalawa, Hilinawalo and ending at Hilisimaetano village. Lunch will be served at local restaurant and free program ensued at your leisure. We recommend you to explore, and better yet take a dip at the pristine Nias beach on your free time. Day 04 : Teluk Dalam – Gunung Sitoli After breakfast and early check out, we will travel north to visit Nias traditional houses at Tumori Village. Take a look at the ancient 50 – 120 year old houses and listen to the guide’s explanation of the unique Tumori’s tradition. Lunch at the local restaurant and enjoy free activities at your leisure. Day 05 : Gunung Sitoli – Medan After breakfast, you will be transferred to Binaka Airport for flight return to Kuala Namu Airport Medan. We trust you had a pleasant trip and sincerely hope to see you again on your next trip! Please enquire with us with your travel needs to get comprehensive price for Sumatra 5 tour package. Feel free to contact us for special tour arrangement.